Thanks to modern technology and increased computing power, external data storage devices are much less cumbersome and unwieldy than only a few short years ago. In fact, many such devices are now stylish and pocket-sized; allowing for easy transport and storage. It is for this reason that an external hard drive has become the best option for secure data storage for millions of individuals around the world. Still, it may be difficult to select the correct storage device that suits a specific requirement. Therefore, let us take a brief look at some of the most important variables that need to be considered. This may appear rather obvious, but it is undoubtedly worth mentioning. Not all drives are the same size. Surprisingly, this has less to with storage capacity and is more associated with the style of the device and the amount of ports (connections to other computers) that is contains. For those who may find themselves travelling frequently, it is obvious that smaller storage drives are optimal. This can prevent damage and theft while helping to ensure that the object will not occupy an excess amount of space. Thankfully, there are many sites that will help one decide which type is the best option. The second primary concern is the amount of data which needs to be stored. Many devices can now accommodate terabytes of information, although storage in the range of gigabytes is still the most common. For those who wish to store movies, video files or vast amounts of digital data such as photos, higher memory capacities are all but a necessity. Text files and portable e-books will require less space. There are many individuals who wish to have their external hard drives appear rather obscure. This may be due to the sensitive information contained within or simply for fashion reasons. In these modern times, there are a number of alternatives to the rather utilitarian appearance of this hardware. External drives can appear as a book, a mobile phone or (as the case with USB drives), they can even take on the illusion of being nothing more than a house key. 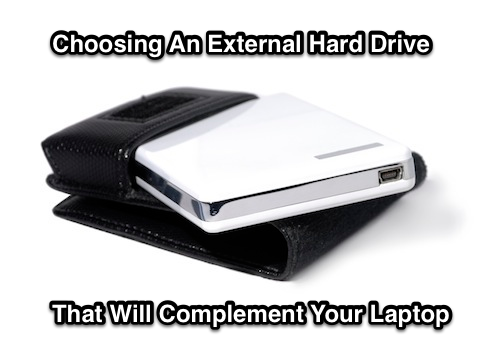 These are the three most important factors to consider when choosing a data storage device that is most appropriate for a laptop. With a remarkably wide variety of options to choose from, even the most discriminating of tastes can be satisfied.